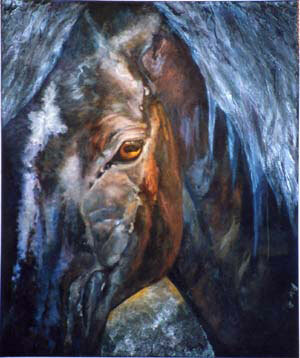 Horses are a favorite subject for Tyson paintings. The subjects of her paintings range from horses to Wal-Mart parking lots, a diversity that seems appropriate for someone who spent her life teaching English and now in retirement is an award-winning painter. An exhibition entitled "After Class and From My Heart: Paintings by Barbara Tyson" opened Tuesday in the Lowman Student Center Gallery on the Sam Houston campus. An English professor at Sam Houston State from 1972-2001, Tyson is now pursuing a long-cherished retirement goal, to return to full-time painting after years of enjoying her art as a hobby and vacation pleasure. "I'm especially thankful to Martin Amorous," she said. "He welcomed me into his painting classes when I walked over from the Evans Building to the art department offices in the fall of 2001." Tyson's "refresher" work under Amorous, who chairs the department, and other talented SHSU artist/faculty members, was not her first experience in an art classroom. 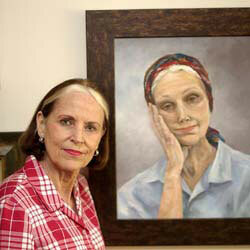 Her undergraduate majors at Baylor University were English and art. Tyson's paintings display mostly large canvases of Texas landscapes, especially the big-clouds and big-sky panoramas that native artists seek to capture. But the show includes a variety of subjects that she paints "by heart," including horses, fishing lures, native deer, local flowers. For her watercolor of "General Santa Anna's Saddle," she painted from the original saddle and bridle that are permanently displayed in the Sam Houston Memorial Museum on the university campus. As a member of Huntsville's Cooperative of Working Artists, an affiliate of the Lone Star Art Guild, Tyson has entered area juried shows during the past year, winning many ribbons, including a "Best in Show" in the Woodlands League for her oil painting "Shiro Rainy Day." Her "Nightlights" depicts a sunset spectacle that she witnessed across the highway from Huntsville's Wal-Mart parking lot. Tyson is often told that her landscapes are "serene" and "atmospheric." Tyson also works with area artists to promote Huntsville cultural arts activities. She is on the program committee for the Wynne Home Center as well as publicist for the Cooperative of Working Artists. Once the faculty chair for the university's Student Publication Board and the Academic Research Committee, Tyson said she is delighted that the Lowman Student Center is offering her a venue for her first solo art show. As a long-time Sam Houston faculty member, and then a short-span Sam Houston art student, she said the three-week show is "in the best place and at the right time" of her life. The exhibition runs through June 14. Hours are 8 a.m. to 5 p.m. weekdays and 7 a.m. to 9 p.m. after summer classes begin June 2. A reception is scheduled from 5-7 p.m. Thursday June 5.